See here for a desription of the “Quality parameters” in the stationView web application. 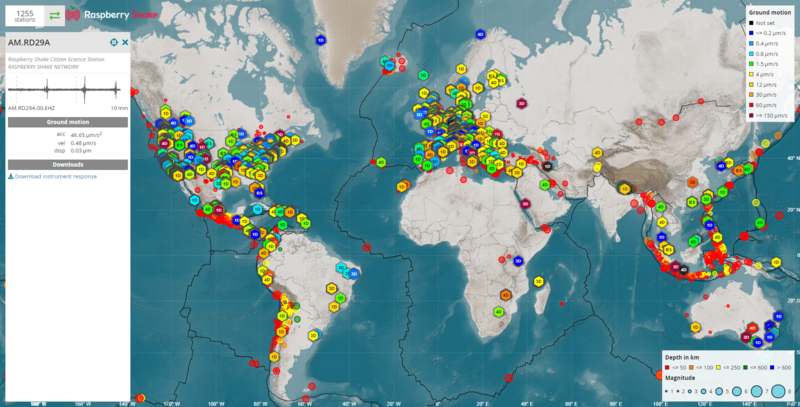 EQView is a map of global earthquake solutions generated using the Raspberry Shake network. This means that YOU are now your own source of earthquake solutions. 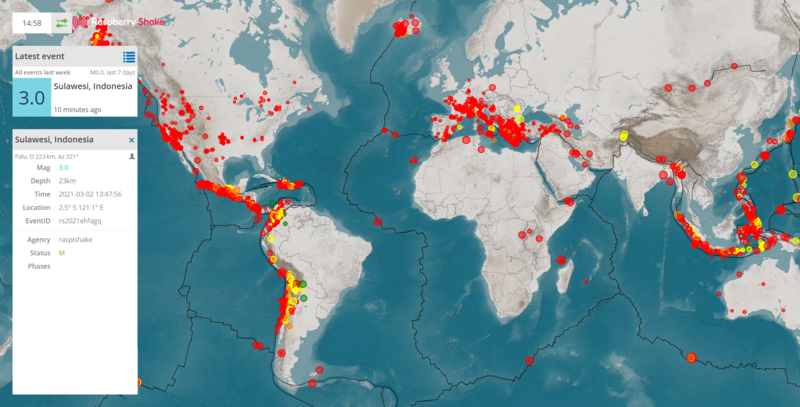 The denser the network, the faster and more accurate the earthquake solutions. So please help us spread the word. Currently only available for Android users. raspishake2sound generates a video showing the waveform and spectrum together and converts the waveform to the audible frequency range of the human ear. Note that the audible frequency range of the human ear is 20 - 20,000 Hz and most earthquake energy is in the roughly 0.8 to 5 Hz range, or well below what is audible. What you hear is the normalized samples of the input trace, fed to the sound card with a higher sampling rate. In a way, you indeed listen to the earthquake. Technical details: Samples of the input trace are 1) normalized (max.value becomes 1, other samples scaled accordingly); 2) written to a MP4 file with a new sampling rate (more on this below); and 3) this MP4 file is amplified by 10 dB and re-sampled to some standard audio sampling rate like 44100Hz. The new sampling rate from step 2) is determined as follows: input sampling rate is just multiplied by 140. This makes a trace recorded at 50 Hz (SHZ channels) become a sound sampled at 7000 Hz (quite audible), and a trace recorded at 100 Hz (EH?/EN? channels) become a sound with a 14000 Hz sampling rate. Because the number of samples remain the same, the MP4 file becomes 140 times shorter than the input trace. For example, 900s of input trace becomes ~6.4s of audio. The same events are returned as are available at EQInfo and EQView. This is not configurable, but you can always enter the event time below if you want to look at an event that does not appear in the list.